59/92 David Mumpower The glass is half-full argument: it beats Scooby-Doo. The glass is half-empty argument: what doesn't? A long, long time ago, let’s say somewhere in the early ‘80s, a fat cat who loved lasagna was all the rage. The comic strip Garfield was enormously popular, with dozens of books, products and even a television series that were all spawned as a result of the disdainful little (?) dude’s infamy. Fast forward 20 years, and 20th Century Fox has seen fit to unleash a combination CGI/live action version of the feline and his friends in a big screen theatrical release. Really, though the comic has certainly fallen in popularity over the last several years, the movie doesn’t sound all that awful. The premise revolves around a day-in-the-life of Garfield and his owner, Jon Arbuckle – a rather eventful day, that is. Jon decides to take in a sweet but dumb dog named Odie, and Garfield’s idyllic existence where he is the center of attention is turned awry. The cat decides he wants one thing and one thing only: Odie out of his life for good. Instead, the tables get turned on him when the pooch is dognapped by a mean dog trainer, and Garfield feels responsible. He somehow pulls himself away from the television and the food dish to help the hapless pup. According to Jim Davis, creator of Garfield, the CGI versions of Garfield and Odie will be somewhat realistic while retaining their very recognizable characteristics. Both will have fur (assumedly like that of Sully in Monsters, Inc.) and will move like the actual animals they represent. 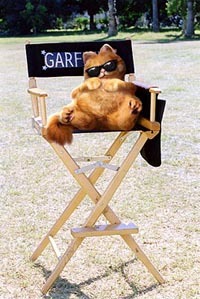 Playing the “part” of Garfield will be the criminally underrated Bill Murray, who really is a great choice for the role. The voice actor who had played Garfield in the past, Lorenzo Music, died in 2001, but he and Murray do have a connection of sorts. Because Murray was unavailable for the animated version of Ghostbusters, Music stepped in to provide the voice of Dr. Peter Venkman.